After a couple of extremely well known Agency Group titles that still recall fond memories in millions, like yesterday's Sonic the Hedgehog, it seems like the right time to circle back around to a more obscure, arty, unique game that stands out because of how downright weird it is. The commitment of its core developers was so deep that this series actually spawned a few different entries despite never crossing over into the mainstream, and it might just be making a comeback. This strange little series started with a 1997 PlayStation title that let the player control a surprisingly cute green...thing named Abe. Lorne Lanning is one of gaming's true maverick characters; over the course of a decade he spearheaded the creation of the Oddworld universe and four games within it, beginning with Abe's Odyssey in 1997. Abe is a Mudokon, a green, humanoid slave species working in a factory called RuptureFarms. His mouth is sewn shut from a young age, when his parents tried to get him to stop crying. To top it all off, the storyline really kicks in when Abe finds out that the greedy Glukkons, who have already run other species into extinction marketing their food treats across Oddworld, are planning on putting his fellow Mudokons into their next "new and tasty" treat to improve their plummeting profit margin. Somehow, from these dire circumstances, Abe's Oddysee is a funny, entertaining game with true heart. Abe is a dim-witted creature who farts more times than you'd expect in such an intelligent title, but he has a strong sense of morality and always tries to help free other enslaved Mudokons, as tasked by a religious figure, Big Face, he sees after some head trauma. He is also, for the most part, a pacifist who uses the magical powers granted to him by Big Face to possess Glukkon guards and solve puzzles - he'll die very quickly otherwise. The game is an old-school platformer in that sense...one hit and Abe's dead. Plus, while sequel Abe's Exoddus incorporated a more modern save feature, Oddysee used checkpoints, which made for an often brutal experience. 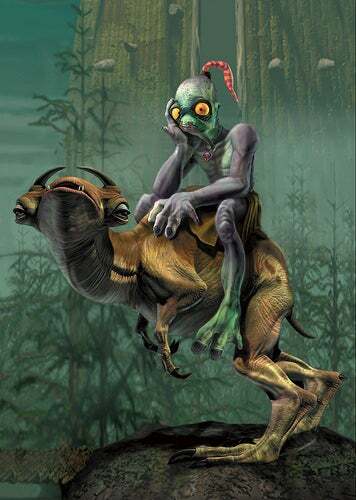 However, one was compelled to finish anyway and see what crazy things Oddworld would show next, which strange alien beings would face you, what smart, chuckle-worthy references would pop up as you went about saving your friends and co-workers. The then-unplanned sequel to this special game literally picked up directly where the first game left off, while the next two expected entries in the planned pentalogy introduced new, equally distinctive heroes, Munch - who worked with Abe in a similar platforming style - and Stranger, who led off an action-adventure Western, of all things. Each game built off of the phenomenal universe brought to us in this modern "Oddysee" and while the main series hasn't been able to continue - seems to be a bit too weird for modern publishers - Oddworld Inhabitants has developed HD remakes of its acclaimed titles, with the most recent, a remake of Abe's Oddysee entitled Oddworld: New and Tasty, set to come out this winter. There's something to be said for a game that revels in how delightfully different, off-kilter and bizarre it is, and like the works of Suda 51, Oddworld: Abe's Oddysee is nothing if not one of a kind. You can download Oddworld: Abe's Oddysee on Steam, GOG, the PlayStation Network and even OnLive...seriously though, does anyone actually own OnLive? OnLive die hards, reveal yourselves! Next up: red and white, all over a pristine city.